USB flash drive for iPhone and iPad by SanDisk./ source via - google search, tech news. 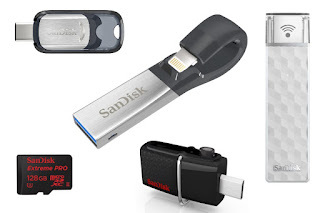 Sandisk has launched a new slim and trim version of its iXpand flash drive of iPhone and iPad users, they studied that people capture images 70% on their mobile phone and there is a huge requirement for mobile storage options. The device will be available in storage capacities up to 128GB and does not have a battery and require charging. SanDisk's free companion app allows users to see music files stored on the iXpand Flash Drive as well as on the device's iTunes library and play both. Users can also take photos and record video through the app in order to save them directly to the iXpand Flash Drive, which keeps space clear on the iOS device and allows for easy sharing. There is also a Wi-fi version announced where people can store their data directly via wi-fi.